Merry Christmas everyone!!! I hope you all are having a great Christmas!!! But I would like to know does anyone have a favorite anime that like to watch during Christmas? 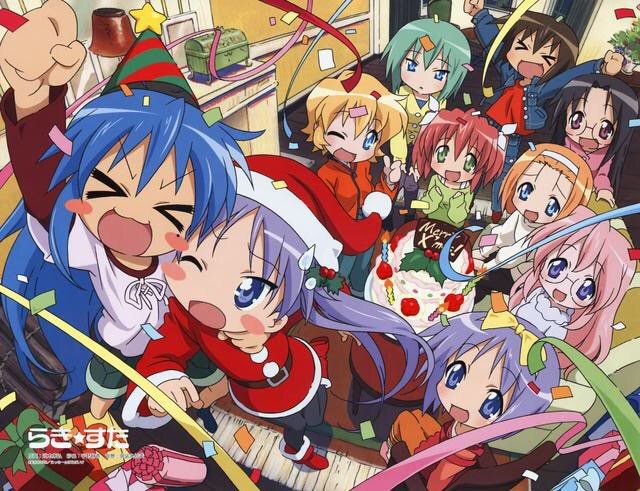 For me mine is Lucky Star just because the Christmas episode is so memorable to me. But comment down below on what yours is and I can’t wait to read them. ← How Should Bleach End?? Pikachu’s Christmas where Vulpix digs her head into a boot for find candy, then gets stuck. Omg that is just too adorable!!! I don’t have one that I watch in particular, but the Christmas episode in Toradora is a good one. Happy Holidays to you! Happy Holidays to you as well but yes Toradora is an excellent one. Merry Christmas, no, I don’t really have a fav show to watch since I don’t watch many shows on Chirstmas so it is typically random. Hey that’s perfectly fine but Merry Christmas to you as well. I just finished Fate/stay night again, so that’s my pick. Merry Christmas to you too!! That’s perfect and Merry Christmas to you too! Yes those are great choices since your right there is a lot of snow so it has that winter wonderland theme going on. I don’t have a Christmas-y anime. I usually watch Christmas movies that are display on Hallmark or on the ION channel! Though Hallmark tend to have VERY cheesy romance Christmas movies, I still enjoy it. It’s super cute and predictable. Yes I like the Hallmark channel to but those movies do get you into the Christmas spirit.